As a Georgia fan, I believe the Bulldogs should stop scheduling games with Georgia Southern University. Think about it: Georgia has absolutely nothing to gain by playing Georgia Southern. If Georgia wins, it's no big deal because they were supposed to win. If Southern ever wins, Georgia will never hear the end of it. 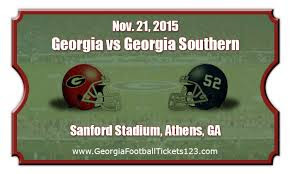 Not to mention the fact that a Southern win would then make the Eagles just like Georgia Tech to Bulldog fans: Hated. Georgia fans admire the Georgia Southern program primarily because of Erk Russell. Seeing the Eagles succeed is an extension of Erk's success.The two go hand-in-hand. There are also many Southern supporters who have always been fans of the Bulldogs. It sounds good to keep it that way. Besides, Georgia has more that enough rivals now. We certainly don't need another one. There's only so much hate to spread around. Play them once twice a decade. No biggie. We play them before Tech to get ready for the triple option. Gives an extra week of preparation and a practice game.